During the Siggraph conference in Vancouver, BC, August 10-14th, GIGAmacro will create the world's first terapixel macro photograph. A terapixel is one trillion pixels and will take four days of continuous photography using three Magnify2 systems to produce over 619,000 photographs which will then be assembled into a single explorable image. History will be made as a one trillion pixel macro image is created using three GIGAmacro Magnify2 systems. Over 619,000 individual photographs of foods from around the world will be captured and combined to create a seamless one terapixel macro image. Using off-the-shelf camera equipment and a dash of ingenuity GIGAmacro will create a fully explorable image with microscopic detail. It’s all happening in The Studio at the Siggraph 2014 International Conference in Vancouver, British Columbia. Attendees at the conference will be invited to participate by constructing a rich mosaic of a wide variety of foods. The mosaic, stretching over 80 feet in length will then be photographed and processed using the latest imaging techniques, using the GIGAmacro Magnify2. As the image is created, large format prints of sections of it will be displayed. To include participants worldwide in the preparation and creation of the image, suggestions for food to be included, as well as comments are invited via Twitter. All tweets that include the hashtag #terabite will be incorporated into the final image. Viewers will be able to zoom and scroll to find their own message preserved for posterity in the world’s first terapixel macro image. The final image will be presented after the conference on the web and on mobile devices, allowing the public to explore, share and comment on the microscopic details revealed in the imagery by using the GIGAmacro Viewer. A resource page with complete statistics, links to high resolution food samples, images, etc is at: http://gigamacro.com/worlds-first-terabite-macro-image-press/. 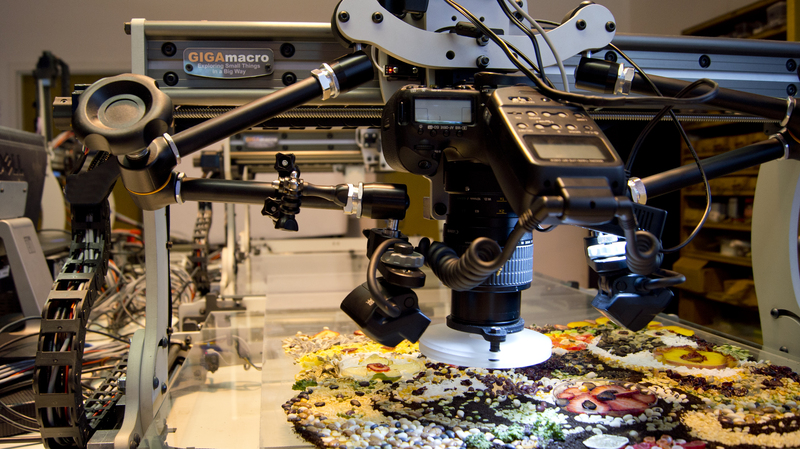 GIGAmacro produces automated systems for capturing, managing, annotating and sharing the world's most detailed macro photographs. GIGAmacro’s systems are in use around the world in manufacturing, science laboratories, and museums that need to capture, preserve and present scalable, detailed macro images. The Magnify2 system is specifically designed for creating gigapixel resolution imagery of macroscopic and microscopic subjects. The complete turnkey system provides the robotics, optics, camera, software, and computing power to create GIGAmacro images with ease. GIGAmacro systems are in use in science, manufacturing, educational establishments and museums worldwide. SIGGRAPH 2014 will bring thousands of computer graphics and interactive technology professionals from five continents to Vancouver, Canada for the industry's most respected technical and creative programs focusing on research, science, art, animation, music, gaming, interactivity, education, and the web from Sunday, August 10th through Thursday, August 14th 2014 at the Vancouver Convention Centre.